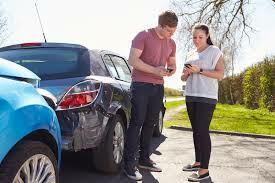 Backup collisions are when a driver puts the automobile in reverse and runs into an object, person, or other car. All cars are equipped with rear view mirrors which are adequate for detecting vehicles behind a car, but they are often inadequate when it comes to detecting small children or objects that are low to the ground and fall in the car's blind spot. Large trucks have much larger blind spots that can hide entire vehicles and large adults. According to research by Kids and Cars – an organization devoted to preventing (non-traffic) motor-vehicle-related deaths and injuries to children – 49 percent of the non-traffic, non-crash fatalities involving children under 15 years old from 2001–2005 were caused by vehicles that were backing up. The Centers for Disease Control (CDC) report that from 2001–2003, an estimated 7,475 children under the age of 15 were treated for automobile back-over incidents. Prevention organizations suggest that parents use common sense, and also take safety measures such as installing cross view mirrors, audible collision detectors, rear view video camera and/or some type of reverse backup sensors. In addition, safer backing up is done when the driver turns completely around and looks out of the rear window of the car, rather than relying on mirrors. This provides a wider field of vision and better control of the vehicle. At this time, rear-end cameras and audible warning sensors and other technologies that might reduce the number of fatalities are not considered standard safety equipment by automakers and are offered only as optional parking aids in some high-end vehicles. It may be years before they become as ubiquitous as seat belts and airbags. Audible warning sensors and/or rear cameras are standard in some luxury brands. Warning sensors can add $100 to a vehicle’s price, a camera system about $300. Aftermarket cameras and sensors range from $150 to over $1,000. Last November, the National Highway Traffic Safety Administration reported to congress that backup accidents are not a recent phenomenon, and disputes the idea that the number of accidents is increasing as the size of automobiles and their rear blind spots grow (such as SUVs and minivans). But a study by Consumer Reports magazine suggests that SUVs, pickups and minivans are longer and taller and that their blind zones extend as much as 50 feet from the rear bumper and contribute to poor visibility. If you or a loved one has been injured in an accident due to another driver's negligence, contact the award-winning car accident lawyers at Davis Law Group to request a free legal consultation with our legal team. We can help you determine if hiring a lawyer is in your best interests, or if you may be able to handle your case on your own without having to pay an attorney. Call our office in Seattle at (206) 727-4000 or use the confidential contact form on this page to get started.